No Fax Machine? No Problem! SparkPost, Twilio, and Cloudinary Are Here To Save The Day! I don’t know about you, but I don’t have a fax machine. Once in a blue moon, I have to send or receive a fax, so I was excited when Twilio shared an awesome way to receive faxes straight to your email using SparkPost. But that is only half the battle. I decided to build the ability to send faxes from an email so I would never need a fax machine again! We’ll build a function so we can send a PDF attachment to [email protected]_DOMAIN, which will automatically fax the PDF to the phone number before the at sign (a.k.a. the local part, for all you email geeks out there). To do this, we’ll use SparkPost’s inbound functionality, Twilio’s Fax API, and Cloudinary to glue them together. We’ll receive an email to a Twilio function, pull off the attached PDF, save it to Cloudinary, and send it as a fax. Next, add the SparkPost MX records for your inbound domain. Once you verify that they are set up correctly, run the following cURL to add your inbound domain. Next, we’ll need a Cloudinary account to store the PDF we’ll fax. If you don’t know, Cloudinary is a powerful solution for storing, manipulating, and delivering all your media. Grab your cloud name, API key, and API secret and put them somewhere safe for later. We’ll use Twilio to consume the incoming emails and send the faxes. To get started, sign up for an account, and buy a phone number that can send and receive faxes. Twilio’s serverless functions are perfect for this project. This isn’t a stateful application and it doesn’t need to be running all the time. Using one, we can quickly get set up and run our application. The messages variable is an object full of the messages SparkPost handed off to us. We’ll need to loop through the messages, pull off the attachment, save it to Cloudinary, and send off the fax. You can see an example the payload SparkPost sends in the API documentation. The important parts for us are the rcpt_to and the content which will contain the raw email. These live inside message.msys.relay_message. We can pull out the phone number by splitting off the local part from the rcpt_to value – everything before the @ . We’ll also need to pull the PDF off of the message. To do this, we’ll parse the RFC 822 value using the mailparser library and return the content of the first PDF attached. Assuming we get an attachment, we’ll need to put it in an accessible spot for Twilio to pull it from. Enter Cloudinary. Using their Node library we can easily pipe the PDF and get the publicly accessible URL. The last step for our code is to send the fax! Twilio makes this really easy. We need three values: the number we are sending to, the number we are sending from, and the media url. We’ll use the number we bought earlier to send for the “from” number. And we should have a phone number from the local part of the email and the media url from Cloudinary! The last piece of the puzzle it to tie our inbound domain from SparkPost to our Twilio function. 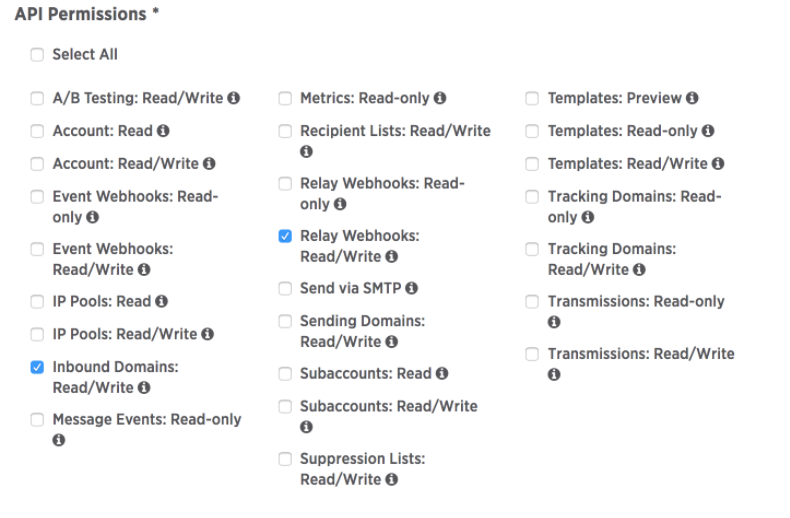 Let’s create a relay webhook to pass all mail sent to our inbound domain onto our Twilio function. Copy your function path and pass it into this cURL request to create the relay webhook. Make sure that “Check for valid Twilio signature” is unchecked so that SparkPost can access it! Send an email over to [email protected]_DOMAIN with your fax attached as a PDF and it should go through! You can set up receiving faxes for a fully working email fax machine with some guidance from our friend Patrick at Twilio! Feel free to reach out if you’ve got any questions and have fun faxing! P.S. Before you launch this to the world, you’ll probably want to validate the phone numbers you’re sending to and add some security to who can send. I’d suggest a token in the email that you verify in the Twilio function. For those looking to go beyond the basics with PHP, explore some PHP frameworks and tools in the wild and learn how they interact with SparkPost. Introducing our PHP 2.0 Library. Check out the changes we’ve made to keep up with the complex areas of our API additions for our PHP client library users.